The U.S. Bureau of Labor Statistics (BLS) releases an annual Occupational Outlook Handbook that discusses the pros, cons, and growth (or not) of specific industries. While the BLS does release a very useful guide for Farmers, Ranchers, and Agricultural Managers, what they don't release is a specific career outlook guide for organic farmers. Still, the BLS guide, along with other statistics show that farming can be a good career choice, depending on how you approach it and if you're involved in niche areas, such as organic farming. According to BLS, farmers, along with ranchers and agricultural managers held more than 1.2 million jobs in 2008 (the last survey year). Almost 80% of these individuals were self-employed farmers and ranchers. Self-employed farming is a career choice on the decline. BLS estimates a 8% decline over the 2008-18 decade. This is mainly because the agriculture sector is getting better at producing the same amount of crops with fewer hands and because land, machinery, seed, chemicals and other farming supplies are becoming more expensive. BLS notes that some less successful farmers are likely to go out of business as market pressures only leave room for more successful farmers. 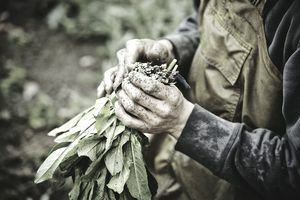 Other good endeavors for organic farmers include catering directly to urban and suburban consumers and participating in cooperatives or community-supported agriculture. These endeavors allow organic farmers to collect a greater share of consumers' food dollars than traditional product sales. While many segments of the economy experienced flat growth or declines in 2010, Organic Trade Association (OTA) findings from their 2011 Organic Industry Survey show that the organic industry grew to a whopping $28.6 billion+ in 2010. Organic Valley Farmer sales are up and growing. Organic retailers are selling more, not fewer organic products as time goes on. In fact, Food Marketing Institute notes that organics are sold in 73% of all conventional grocery stores, while Natural Foods Merchandiser says that nearly 20,000 natural foods stores carry organic products. The Economic Research Service, part of the U.S. Department of Agriculture notes that organic farming is one of the fastest growing segments of U.S. agriculture. The Organic Farming Research Foundation says that USA sales aside, organic food sales are quickly gaining international acceptance, and areas such as Japan and Germany are becoming important international organic food markets. (Hello exports). Recent research confirms that organic crop production offers long-term financial success for many farmers. Overall, the outlook for organic farmers is decent, even very good in some cases. However, keep in mind that certain organic farming practices may increase your odds of success.